Our family was at the cottage for the last week of the summmer before school starts again and the fishing was better than normal. I started the week by taking my kids on our annual musky fishing trip. We load the canoe on the four-wheeler with tackle and camping gear and head into the bush for an hour and a half ride into our lake. This will be our seventh year in a row of fishing this lake and we usually stay one or two nights. The kids have been coming here since they were 7 and 8 years old......the years are flying by quickly.It is a small lake (less than 100 acres) with no buildings other than a hunt camp. We arrived at the lake at 7:30 a.m. after an early start and quickly loaded the canoe to paddle to our campsite. We always fish on our way to the campsite and after 15 minutes my daughter hooks a musky on a hula popper(her favorite lure)but immediately breaks off. “Maybe it will float to the surface” she says and amazingly a minute later that’s what happens and we get her lure back. We tried a leader but the popper wouldn’t work properly so we went back to a direct tie. We set up camp and got back to fishing . 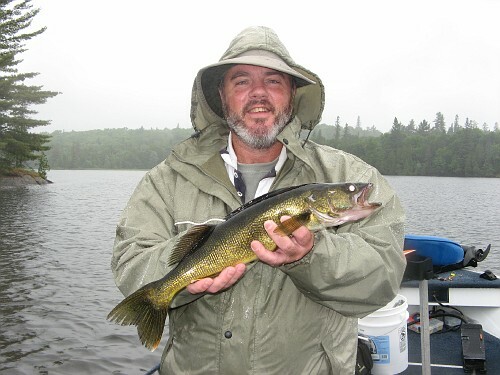 The smallmouth in this lake are short stocky fish that fight like drunken Irishmen.The musky are usually 24-34 inches but we have caught a 41 inch fish. My son landed the first musky after a splashy fight. It was 4 pounds and felt great to land as we have never been skunked on this lake by musky.My daughter threw her popper into the foam created by an inflowing creek and got a huge strike.We were all thinking musky at first until a huge bass cleared the water. After we landed the fish it measured22.25 inches and we guessed it around 5 pounds. I set it on my canoe paddle which is six and a half inches wide and it covered it completely . We released it for another day and continued on. My daughter got another strike and break off on her popper in the same area as the first strike and sure enough it floated back to the surface again. We kept a small bass for our shore lunch and fished all afternoon. We caught more bass between 1.5-2 pounds lost another huge bass and landed one just shy of 20 inches. We portaged to another lake which was loaded with small bass(almost a fish per cast) checked out a different hunt camp on another lake and started heading for camp as it was only an hour from dark and we had 4 km. to travel. As we paddled up the river we came upon a cow and calf moose feeding on shore. We got to within 20 meters before they noticed us. After a stare down they took off into the bush with much snapping of brush and trees . Both kids said it was their favorite part of the trip. 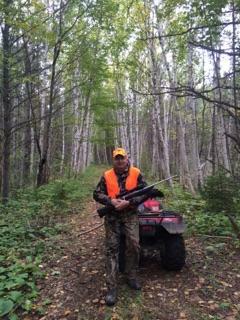 We ate a hearty supper of bass ,potatoes and corn on the cob and after a short fire we called it a day. The next day we fished at first light and caught more bass and four muskies. The musky were smaller this year with all fish between 26-32 inches. It started raining around 10 a.m. and we fished until 4 then packed up and headed for home. Back at the cottage we had company and tubed, jumped off cliffs and also fished there but had very little luck other than a couple bass,one of which was a teenager’s first fish ever! My son and I stole away for an afternoon to fish a back lake for bass that we fished earlier in the summer. All fish were largemouth around 2 poundswith furious action around isolated lily pad patches. I threw a crank bait beside a patch that immediately got hit and as I reeled it in we saw six bass the same size following it. My son cast beside my fish and hooked up.We ended up hooking fighting and releasing every one of them in five minutes of crazy action. 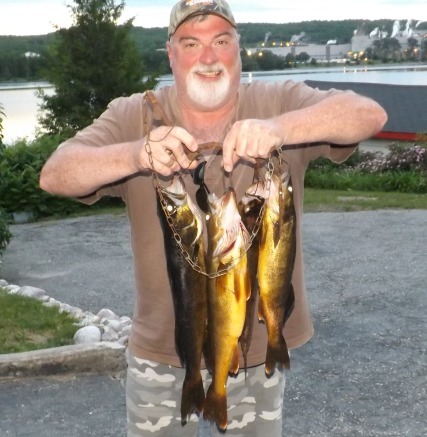 We went back to the cottage and had a good fish fry with a couple fish we kept. After that we started putting away things at the cottage and packing things away for the season . What a great way to end the summer! Awesome report and results , well done ! Fabulous report (easy to read) and great pic's and video. Wish the video was longer as I love watching videos of wildlife. Thanks for posting. BTW... where did you say that back lake was? Waaaaaaay back... I tried to post another 30 second clip but it didn’t work. Some beauty fish in the pictures.